The final stretch of the road from Sivasagar to Charaideo is actually a part of the historic “Dhodor Ali”, literally the “Road of the Slackers”. This is called so because the king got it built by forcing the less hardworking members of the society who were otherwise known to do no productive work. This made me wonder, what would have been the state of a travelling slacker in that kingdom? This was not a very pleasant realization for me. Nevertheless, I carried on. Charaideo (Che-Rai-Doi) roughly means a town on the foothill of the mountains in Tai language. The Ahoms, who originated from the Yunnan province in China, descended here from the Patkai Mountains and made it the capital. Later on the capital moved to nearby Garhgaon and eventually to Jorhat. As of now what is left here is a series of graves (called “Maidam”s, and don’t mistake it with the generic Indian word “Maidan”) belonging to those kings and other members of the royalty. I reached Sivasagar in the afternoon after a trip to Majuli. There was a lot to see in the town in less than 24 hours. So, I decided to first be done with the one that is the farthest and took the bus to Charaideo, which is 30 Kms from Sivasagar city. The bus moved at a snail’s pace and took almost one and a half hours to reach. It was 4 PM and as I feared, it was already getting too dark for photography. As the entire country follows one time zone, the sun rises and sets too early in the easternmost parts of the country. This is why the debate for separate time zones keeps rearing its pretty head time and again. Anyway, I got my tickets and tried to make the most of the situation. The site seems to have been repaired and beautified so it was good to finally see an archaeological site in Assam that was not in a completely neglected state. The protected maidams are on the top of a small hillock, now adorned by stairs and a couple of cannons in front. As I reached the top, a series of hemispherical mounds appeared. They were mostly earthen mounds with no opening. But I could see a couple of larger ones in the vicinity. Eventually I reached the one that had an opening, sort of a gate with a door made of stone. It reminded me of the little homes of the Hobbits. Only catch here is that the ones coming out will be the undead ones. In spirit, these maidams were close to pyramids. The interiors of these mounds worked as crypts for burying dead kings along with valuable items and food for the afterlife. According to some details they also buried servants, pets, and even wives along with the dead king. I hope those stories are not true. I climbed up the next hillock, overlooking the vast tea estates on the south. This is the point that gives a good 360 degree view of the area. I realized that there are even more maidams on the eastern side of this complex. It was getting dark so I came out and tried to reach that part. The entry to the eastern side had a separate gate and more importantly it was locked! It was only 4.30 PM but the people at the gate said that this other part closes down at 4 PM which really made no sense to me as the other side was still open. It looked like more of the same from outside so gave up on that and started coming out, while silently cursing the usual bureaucratic whimsy. As I was coming out, I noticed a shiny oriental structure that nobody told me about earlier. It seemed to be a new structure but as you might have guessed it already, it had also closed down by then. But I did like the design of the building, basically a museum dedicated to Chaolung Sukaphaa, the founder of Ahom Kingdom. It is named evocatively as “Yunnan to Patkai to Che-Rai-Doi”, describing his epic journey. It is noteworthy that the Ahoms gradually converted to Hinduism and gave up the practice of burying. But even then the ashes of some of the kings were buried. Over the years many of the maidams have been looted and vandalized. Originally there were more than 150 of these maidams in this area but only around 30 of them have now been protected by ASI. ALso, it would have been great to know which grave belonged to whom but I think that information is not available anymore. I returned not fully satisfied but at the same time there was enough to see and ponder about. This is only the first glimpse of my recent trip. I will soon be back with much more of Sivasagar, and also of Majuli. Stay Tuned. It is 30 KMs from Sivasagar town. Look for buses or shared vans going towards a place called Sonari. Ask the bus conductor tp drop you at the right place. What to see at Charaideu? 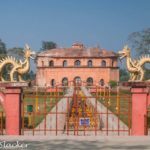 There are “maidams” or royal graves of the Ahom Kings. There is also a small museum. Go early and try to wrap it up latest by 4 PM. Keep at least a couple of hours for siteseeiing. What are the ticket price? INR 15 for Indan travellers and INR 200 for foreign nationals including camera charge (non-commercial). Beautiful informative post. Amazing pics. Wow! I had never heard about them until now! I am happy reading your posts as you share some real interesting places! This looks like a really fascinating destination. It doesn’t look like there were too many people around, is that the case? Well, it doesn’t look like there were too many living people around! It was nice learning about the Maidams. Sad to know some of them have been looted. There are so many unknown places in India which are so beautiful. I have not explored this place before. The monasteries are beautiful. The town looks so picturesque and untouched. A real gem waiting to be discovered. Those mounds reminds us of our trip to Stonehenge in England which have several of these mounds and barrows of all sizes and shapes which are believed to be religious significance or may be used to bury the dead but the mystery remains. We have great fascination for the monasteries and the one in picture looks beautiful and so peaceful. Charaideu looks like a lovely place to saunter around and explore history untold. Hi, Jitaditya. Super interesting post! To think that this place holds the graves of ancient kings. However, I have mix feelings about the design of the museum dedicated to Chaolung Sukaphaa. In a way, I think it disagrees with everything else in this place. This sounds like a very interesting place. I have also read about the servants and wives being burried along with the kings so that they could serve him even post his demise. Always found it to be a cruel ritual. Anyways, coming to the museum, I have got to agree with some other readers here that it disagrees with the everything else in the place. It is an interesting post. Almost like discovering a new place like this. The place is very quite and peaceful. This is an off-beat destination i think. The pictures are nicely take. I did not know about the Maidams and how they were used to bury the kings. It is such a pity that a place decides to shut down at 4:30 PM because of being in different timezones. Will definitely keep this in mind. The maidams remind me of the stupa I have seen near Varanasi. They look a bit similar and seeing your photos I automatically thought about that place. It’s interesting to know that there used to be over 150 maidams in the past but now only 30 still stand up and are protected. I’ve never heard about this amazing place, glad that you’ve written about it 🙂 It has very mysterious spirit. I would love to explore it one day. Is a camera charge normal at sites like this? I’ve only seen it a few places in Europe, so my experience isn’t that great. Why do they do that? This looks like a really interesting site though, immediately got my attention with ‘Hobbiton’ haha. They have graves like this in Korea as well! Looks like you are combing the entire place for some must visit destinations. 🙂 A good super guide is coming up for sure. I wasn’t aware of maidams. But for the closure timings it was a very good post. So much information. I feel like there is nothing I could possibly miss now, really well written! The pictures are beautiful as always. How big was it inside maidams? I am always amazed by underground structures. I always picture the people that actually had to dig the holes and start the construction. I find it hard to comprehend sometimes! Being in India, I have never even heard about this place. It is an another place to be bookmarked. I loved the entire place as from your pictures I couldn’t spot any people. Very Interesting article.Thnks for sharing. This is a lovely hidden gem…I sure would love to discover it for myself. I loved the fact that it is fairly well preserved and free from crowds. I would love to know more of the tales behind those graves. Wow! Thank you so much for writing about this place. I had never heard about it. The photos are tempting me to visit it! Great work!